(19) Service before personal growth. Why is this such an important quality? To the disciple approaching the path of service it may seem that personal growth will be sacrificed, but is this the case? What are the personal benefits of unselfish service? For the beginning seeker personal growth is number one, but as one proceeds upon the path something else comes to the forefront. 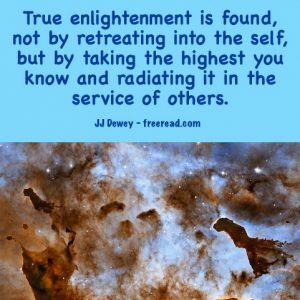 Service to humanity is seen as much more important than the progression of the tiny self. The average seeker may think that this is an obvious quality and that the majority of seekers endorse this principle. They may in word, but few are able to carry out this principle in deed. Because we all have an innate desire to make as much spiritual progress as possible. In fact when one first enters upon the path it is sometimes difficult to think or be concerned with anything else. The aspirant desires to climb and learn and progress with almost an obsession at times. He may be happy to rub shoulders with other seekers and share knowledge to a degree, but to serve others at the expense of his learning and progression is often far from his mind. The Ancient of Days who is the voice for the Planetary Logos set the example for us. He is a disciple or the Solar Logos and instead of staying in His aura and making further progress in direct learning He sacrificed himself and came to this little unimportant planet to become a Father to developing humanity and guide them until they enter the Kingdom of God. Alice A. Bailey words it well saying this about the Ancient of Days, Sanat Kumara. “Under this Law of Sacrifice, Sanat Kumara (to express the idea in occult terms) “must turn His back upon the Central Spiritual Sun, and with the light of His Countenance irradiate the path of the prisoners of the planet.” He sentences Himself to stay for as long as may be needed, “acting as the Sun and light of the planet until the Day be with us and the night of pralaya descends upon His finished task.” Thus and only thus can the light of the Central Spiritual Sun begin to penetrate the dark places of the Earth; when this happens all “shadows disappear”-an occult reference to the all-embracing radiance of the Monad as it absorbs both its reflection, the soul, and its shadow, the personality. While it is true that we do concretize much of our learning through service, there is also substantial sacrifice involved. Keep in mind here that even though we are leaving the age of sacrifice (Pisces) and going into the age of service (Aquarius) that we do not leave sacrifice behind. Instead, we take with us the usable fulfilling aspects of it. In this age sacrifice will be seen more as a payment for goods that will be received in the near future. The servant disciple may have to go long periods where he has no direct contact with a teacher who will feed him with higher knowledge. He may have no time to read books, learn new skills, attend interesting classes and seminars. The work he is given to do may take close to 100% of his time for some period. So why do all the great lives on down to human disciples make great sacrifices to serve? The answer is that service is not a sacrifice as it is defined by ordinary humanity. Instead it is a form a payment that must be made to insure the next great step in the disciple’s progression. The principle is this. The progression of aspiring entities goes through cycles of learning/receiving followed by service/teaching. After a person finishes a cycle of learning/receiving served by one greater than himself the time comes for him to follow the example of his teacher and move into a cycle of service/teaching. Even if the disciple is dragging his feet and sluggish about changing his mode he is eventually forced into service. And what is this force? It is this. When the cycle of learning/receiving and being served is completed his progression comes to a standstill. He may gain facts and knowledge after the cycle and have the illusion of progression, but he comes to realize that the law is that real progression in usable learning cannot continue until he takes what he has gained in the learning cycle and gives it out freely to others who are seeking as he once did in the past. This law of cycles literally forces the disciple to make a decision that takes him into a period of service. After His work is done He will then turn his face toward the sun or Solar Logos and become a student again and go through another long cycle of learning/receiving. How do we know which cycle we are in? The average person goes through several such cycles in one lifetime and must tune into his inner self and sense the sending or receiving mode. If he feels a passion to teach that is a clue he is in the sending mode, but if he feels a passion to learn that is an indication he is in the receiving mode. If he seems to be drifting with no such passion he is probably between cycles. In this case he must follow the highest he knows and the correct passion will soon come. (20) The acceptance and understanding of freedom. No they do not. Freedom is actually a difficult principle to accept and the lesser lives are happy to give most of theirs away for a bowl of porridge. Even though this is listed last, it is perhaps the defining principle of discipleship. The basic distinction between the light and dark brotherhoods lies in the execution of the principle of freedom. One of the problems with these controversial issues is that both sides always think they are promoting the highest and best freedom. The truth is there is much illusion associated with freedom and it always manifests on one side of the argument and often appears on both sides. Let’s take abortion for instance. The conservatives are against it in the name of freedom for the unborn and the liberals support it in the name of freedom for the born. If one is unbiased he will see the virtues of both arguments but few seem to be objective here. We are going to explore this important principle in more detail. Question: If both sides of the fence have their arguments for freedom how does one decide which decision to make or which side to take? Let us take an example. The State decides to increase taxes of the people without their consent and give the money to retired people. The results are that the people taxed have less freedom, but the retired people have more freedom. Since one group of people are being given more freedom is the basic principle of freedom being followed here? If not, why? God is not the plucking of the string, but is in the string, or wavelength and adjusts the vibration by the power of decision. The infinite number of wavelengths are occupied by intelligence just as our bodies have intelligence in them (us). As the lives within the physical bodies (which are also made of wavelengths) produce harmonics and overtones so do all lives on all levels evolve through the small and great vibrating wavelengths. The reflections of the One Great Life do all the building in the universe with their developing intelligence. The One God experiences through them and thus savors all experiences within the realm of possibility.